If the Universe were a pie, we would be the sugar on top: the stuff we are made of, called baryonic matter, constitutes only 4% of the total mass-energy in the Universe. Dark energy would be the filling — it’s 73% by mass-energy — and dark matter would be the crust, 23% by mass-energy. In this post, we will be concerned with the interplay between the crust and the sugar. While in a real pie, the sugar gets put on only after the crust is hardened, in galaxies, it turns out that the baryons affect the density profiles of the dark matter halos. The paper I discuss here shows this indirectly by deriving the density profile in the inner regions of the halo and pointing out that it is different from that predicted by baryon-less (cosmological constant and cold dark matter only) structure formation simulations. The author takes 39 massive early-type galaxies from the Sloan Lens ACS (SLACS) survey (the ACS stands for “Advanced Camera for Surveys,” an instrument aboard the Hubble Space Telescope). The mass of dark matter is determined by gravitational lensing, which is when light from objects behind the galaxies is bent by their mass. The mass of baryonic matter is determined by fitting models to the measured Spectral Energy Distribution (SED), which is just the energy flux received as a function of wavelength. The author then simply calculates the dependence of the dark matter density on distance from the center of the galaxy. The typical density profile used to model dark matter halos is a power law with , so the result is simply presented as a value of . To understand what it means, we have to know the very basics of dark matter halo modeling. with the density, the radius, Newton’s constant, and the velocity dispersion (proportional to the square root of the temperature by the Equipartition Theorem). The density profile the author computes from the sample actually agrees quite well with this: they find that is about . 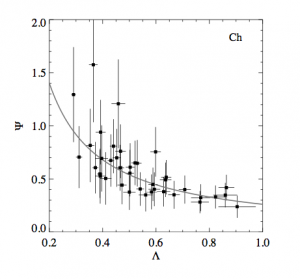 The author makes assumptions about the number of stars formed at different stellar masses (encoded in the Initial Mass Function, or IMF), but he tests several different assumptions and they do not significantly affect this result. Either way, though, the key point is that structure formation simulations without baryons usually predict a much smaller value of : about . This means that the dark matter halos the author studies actually have much steeper density profiles towards the center than baryon-less simulations predict. The author presumes that it must be the presence of baryons, along with the complicated feedback mechanisms and interactions they can induce, that is behind the difference. As the author also notes, it is likely that the particular history of the each halo’s formation also plays a role in the density profile of the dark matter. Whatever the precise mechanisms behind dark matter halos’ structure, though, this study makes one thing clear: the matter matters!